Whether You Sell or Shop—You Can Really Clean Up! 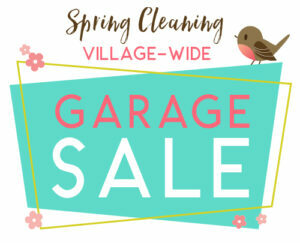 The Spring Lake Village DDA is sponsoring a free Village-Wide Garage Sale Day! Village residents can display items for sale on their front lawns and driveways from 9:00am to 4:00pm on Saturday, May 11th and the DDA will promote it. We will be doing this in partnership with our friends in Ferrysburg and their “Trash to Treasure Day” to really create some awareness. Participants can register their address with the Village and then be placed on a map which will be available on this website and for pickup at Village Hall. Stop in at 102 W. Savidge to register or call 842.1393 to learn more. The deadline to register your address with the Village is Monday, May 6th.